of diagrams in his hand, conversing with Perspective, the next figure to him, who is attentive to the Principles of Geometry as the ground of his Art—which Art is represented by the frame on which he rests his hand. On the left, near the window, is an artist busy designing, at whose right hand is the Genius of Drawing, presenting the Artist with various patterns. The back figure is Architecture, measuring the shaft of a Tuscan column, and on the background is the Temple of Fame, to which a knowledge of these arts directly leads." Truly, poor Sheraton found the key to the portals of that Temple, and has been posthumously crowned with the laurels after which he fought so hard; though during his lifetime, alas! he wanted for the barest necessaries of existence. After the perusal of the foregoing sentences, which, though they read curiously now, were quite in the spirit of the times when they were written, it is amusing to note how faithfully Sheraton followed the example set by his contemporaries and indulged in uncomplimentary references to the books brought out by his predecessors and competitors. Most are summarily dismissed in a few lines as almost beneath notice, because they contained little or no instruction concerning the arts of drawing, geometry, and perspective. In dealing with Heppelwhite's book, this designer says : " If we compare some designs, particularly the.chairs, with the newest taste, we shall find that this work has already caught the decline, and perhaps, in a little time, will suddenly die in the disorder. This instance may serve to convince us of that fate which art books of the same kind will ever be subject to. Yet it must be owned that books of this sort have their usefulness for a time, and when through change of fashions they are become obsolete, they serve to show the taste of former ages." "the decline"—if that disease ever really touched his works, which is very much to be doubted—was wonderfully rapid, and remarkably complete. The " sudden death from the disorder" has not occurred, and, notwithstanding the lapse of time since it was prophesied, need not be anticipated yet awhile. We have sufficient evidence in Sheraton's writings alone, quite independent of the testimony of others, to lead us to recognise the fact that he was a man of exceptional rectitude of character; and I shall make bold to claim that this rectitude is strongly and unmistakably reflected in most of his designs—including even simple chairs and tables. I may be laughed at for making such an assertion ; but in that light I regard his designs. Throughout, the work is conscientious in the extreme ; and the straight line, free from deviations, predominates everywhere. The " Louis-Quinze," so beloved of Chippendale, exercised no fascination over this upright old master, who very seldom indulged in the introduction of much constructional shaping where he could possibly avoid doing so. It is of the greatest importance that the student should make a particular note of this fact, for it will aid him materially in distinguishing between " Heppelwhite" and "Sheraton," especially where chair-backs are concerned. It is true that each borrowed from the other to a greater or less extent, for, as we have already noted, there are chairs in Heppelwhite's book that are most distinctly " Sheraton," and vice versa. Thus, in many instances, it is very easy to confuse the two styles; but they must not be confused, and I am endeavouring in these pages to show how each may be distinguished from the other with every possible degree of certainty. have wanted them to suit a broker's shop, to save the trouble of borrowing a basin-stand to show a customer. 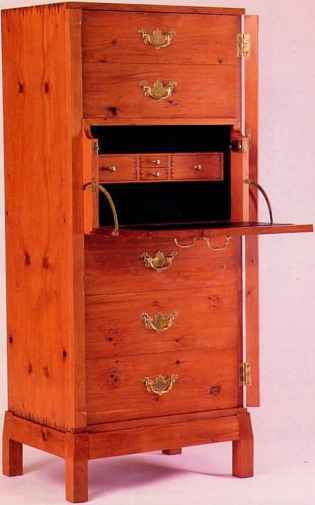 Some have expected it to furnish a country wareroom, to avoid the expense of making-up a good bureau, and double chest of drawers, with canted corners, etc. ; and though it is difficult to conceive how these different qualities could be united in a book of so small a compass, yet, according to some reports, the broker himself may find his account in it, and the country master will not be altogether disappointed; whilst others say many of the designs are rather calculated to show what may be done than to exhibit what is or has been done in the trade. According to this the designs turn out to be on a more general plan than what I intended them, and answer, beyond my expectation, the above various descriptions of subscribers. However, to be serious, it was my first plan, and has been my aim through the whole, to make the book in general as permanently useful as I could, and to unite with usefulness the taste of the times ; but I could never expect to please all in so small a compass : to compose an entire book for each class of subscribers, and after all, there would be something wanting still." We must now, however, leave generalisation, and commence our study of " Sheraton " as a style; and following the plan adopted in my chapters on " Chippendale" and " Heppelwhite," we will deal with chairs before considering larger and more imposing pieces.